Twenty-five years is a milestone in any capacity. It is an occasion to be celebrated, and Interfaith Caregivers is doing just that. Haddonfield’s Interfaith Caregivers turns 25 this year, and it is hosting a gala, not only as its annual fundraiser, but also to celebrate the milestone. The Interfaith Caregivers’ 25th Anniversary Gala is being held at the Collingswood Grand Ballroom on April 8, with food, entertainment and an auction. “I think it is a wonderful testament to the people of Haddonfield and Haddon Heights, that they have nurtured and supported this organization for 25 years, because this is a unique organization. To have this in our town and to allow every age group to be able to stay and remain a part of the community, I think is just wonderful. We could not have done it without the people of Haddonfield and Haddon Heights, for supporting us by volunteering, coming to events and sending in donations,” Executive Director Mary Ann Bigelow said. Interfaith Caregivers is a nonprofit organization that provides services, such as driving, meals and visiting, to seniors 65 years and older and those with disabilities in Haddonfield and Haddon Heights to keep them living as independent members of society. “We give people time to make the choice of when they want to move out. If they didn’t have our help to continue to be a part of the community, they might have to make the decision to move much quicker,” Bigelow said. Interfaith Caregivers was established 25 years ago by Dr. Joan Gault when she was distressed to find out that an older colleague had missed a community meeting because she could no longer drive. Gault vowed when she retired she would do something to fix it. When she retired, she gathered a group of people from the community and formed Interfaith Caregivers, providing its first services beginning in February 1991. Since then, Interfaith Caregivers has grown and accomplished much. In its first year of operation, Interfaith Caregivers served 80 clients with the help of 62 volunteers. Now, the organization has more than 300 clients and 400 volunteers, four of whom are founders who continue to volunteer where they can. It has also made sure to keep up with the times in regard to technology. Originally, assignments were given by calling people over the phone. According to Bigelow, with more than 100 assignments a week on average, and oftentimes taking three phone calls per assignment, that totalled 300 calls a week. However, since then, Interfaith Caregivers moved to email and now has a scheduling system that allows volunteers to go online to choose an assignment that works with their schedule. Interfaith Caregivers also has a Facebook page that people can like, www.facebook.com/ifchaddons. “I hope we are still here for another 25 years and continue growing and changing as the community and technology change so that we are still vital and a part of the community,” Bigelow said. celebrated in a big way with a gala. 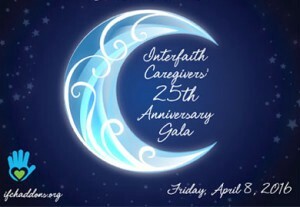 The Interfaith Caregivers’ 25th Anniversary Gala is being held at the Collingswood Grand Ballroom, 315 White Horse Pike, from 6:30 p.m. to 10:30 p.m. There will be an open bar for wine and beer, hors d’oeuvres and a sit down dinner, entertainment and an auction. Tickets are $125 per person. “It’s going to be a really fun night, and we would love to have people come out and attend. Our co-chairs have done a fabulous job of putting together this wonderful evening. It’s a great opportunity to come out and greet neighbors and celebrate this accomplishment,” Bigelow said. There may still be tickets and sponsorship available so it is recommended to get in touch with Interfaith Caregivers as soon as possible. Those interested should call the office at (856) 354–0298 or visit the website at www.ifchaddons.org. “No amount is too small. We are grateful for anything people can provide,” Bigelow said. Coming up for the Interfaith Caregivers is a new volunteer orientation on Wednesday, April 20 at the First Presbyterian Church of Haddon Heights, 28 Seventh Ave., from 7 p.m. to 9:30 p.m. There also is a Touch-A-Truck Family Fun Festival May 7 at the Haddonfield Borough Hall parking lot from 10 a.m. to 2 p.m., rain or shine.